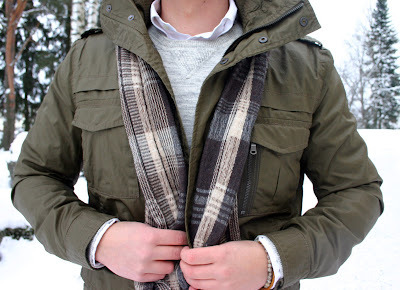 Some time ago when visiting an H&M store I noticed an olive M-65 field jacket on a rack, and after a quick look at the price tag and the material (100% cotton) I decided to buy it without trying it on. I have to say, for the price it was a rather good jacket - the fabric feels quite good and the extra zipper in the other chest pocket is the only "styling feature". Something I still could have lived with. Here we come to a problem often found in all these brands (H&M, Zara..) offering quite stylish and basic items without any visible logos or other unwanted features. 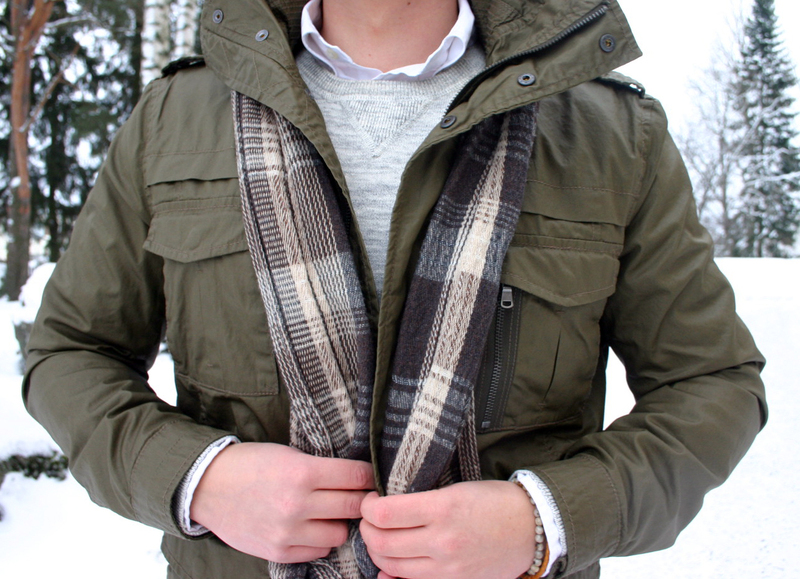 Jackets are too short (and trousers too low-rise). So is this one. If it was an inch longer it would be totally alright, but now simply looks off in proportions and length. Another thing, which sort of fails in this piece is the collar that is too high and without the required structure, leading it to fall all the way to your shoulders in a rather ugly fashion. A shorter collar would stay up without any problems. Anyway, other items here include a grey cotton jumper, white button-down shirt, brown scarf, brown Aspinal of London messenger bag, some old jeans I've had a million years and my Tricker's Stows. Apart from the two (big) problems of the jacket, I like the whole outfit quite a lot. It's also something I would say is pretty hard to screw up and that works in a casual setting from a park in Finland to SoHo in New York. 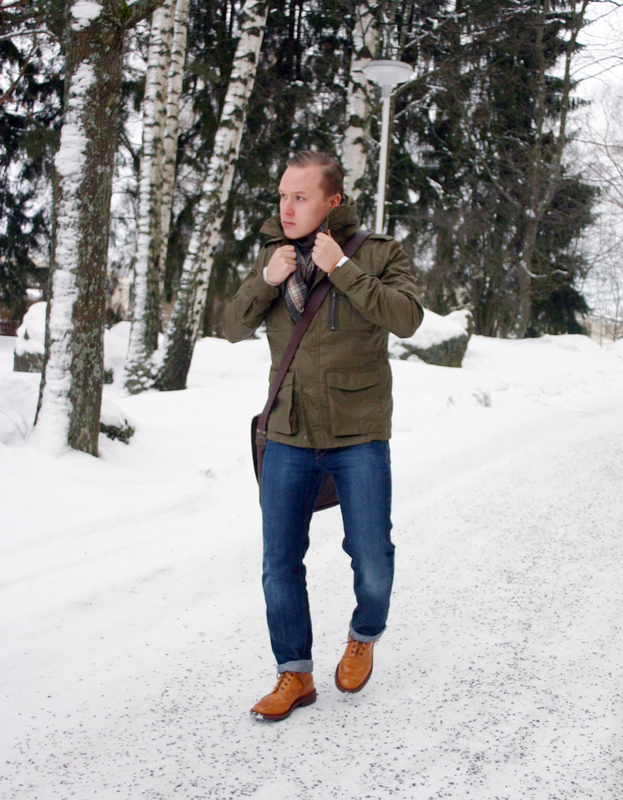 An olive M-65, bd shirt and a jumper, denim and derby boots. Once again, I find myself making the same mistake I still make sometimes. I buy stuff on impulse and against on what I've planned, often leading to something that probably isn't quite right and end up selling it before even using it properly. There was a really good article on Put This On that sided this topic on Monday, which you can find here. A good read for anyone. Nice post, it sums up the problem with these stores' clothes nicely. It looks good from afar, but not when you actually wear it. However, it's hard to believe you bought a jacket without trying it on, no matter what the price was. Thanks. I do think they have things to offer, some cotton or pure wool jumpers offer perhaps the best value for money in my opinion, in those categories. Most high-end knitwear tends to be made with a very boxy cut that I personally don't like at all. The outfit looks great. What more do you want, really? If you want "perfection", then buy Cucinelli. It seems everyone needs to have everything made out of gold and tailored to fit like a glove. It's ok once in a while to have items that are not produced in Napoli. The fit of the jacket on you looks good mate. Remember, it's only a casual look for the fall/winter and maybe spring. One more thing, you'd be surprised that most people will not look at every stitching detail on garments. Ciao! Thanks, and I would agree that the pieces here work together rather well. However, I do think that the jacket should be better proportioned. Now it looks a bit too small and kinda funny, even though it is bang on from the body and the shoulders. And yes, I personally use mostly knitwear from H&M because they actually fit better than most others. Occasionally they have some other stuff that is very good. On the other hand, there are things that I just can't overlook. In this case it's the length of the jacket (and overall proportions). Anyway, thanks for your comment. You have some very good points there, Sir. Thank you for your reply. It's always good to see how others review certain items. Thought I'd share this with you. I was in a local H&M here in NY, and noticed the same jacket. Funny thing, after your review...I didn't even bother to try it on! However, I don't blame you. One must be happy and comfortable with what they where. Thanks again for the response. 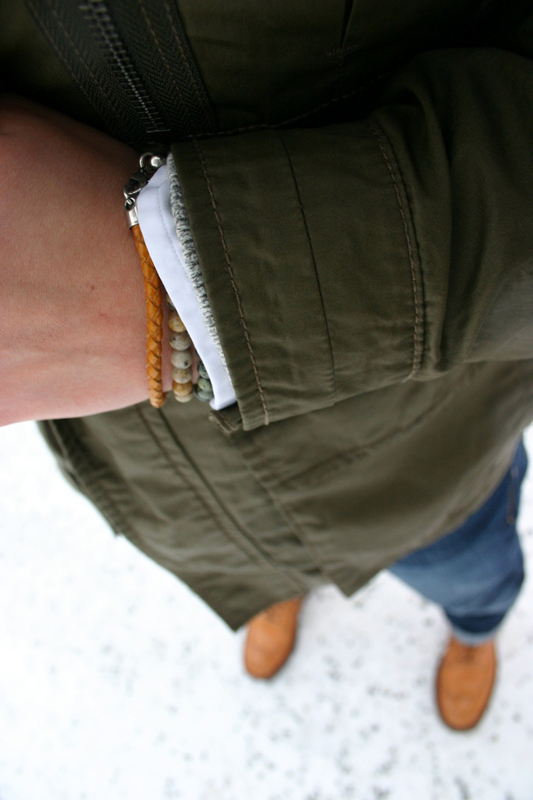 You have a very informative blog, and great personal style. Take care. Thanks a lot. And that's interesting to hear. While I strongly think the way I wrote earlier, it does not mean some piece cannot work on someone else. We're all a bit different shape and size after all. So, if you liked it, try it on the next time.